CLICK HERE to find KKNKOudtshoorn Accommodation. Sizwe Banzi is Dead, the award-winning drama, which was produced by Port Elizabeth born Athol Fugard, John Kani and Winston Ntshona, will be on show at the Klein Karoo Nasionale Kunstefees (KKNK). The 22nd edition of the KKNK will be on show from 24 – 30 March 2016 in Oudtshoorn. “It is an honour to welcome the production and theatre legends such as John Kani and Mannie Manim to the festival. Audiences will also have the opportunity to engage with them, for free, throughout the festival,” says Theart. John Kani’s son, Atandwa Kani, and Mncedisi Shabangu play the roles in this journey of discovery. They give comment on the racial divisions which is still very present in South Africa, through their tongue-in-cheek comments and situations. 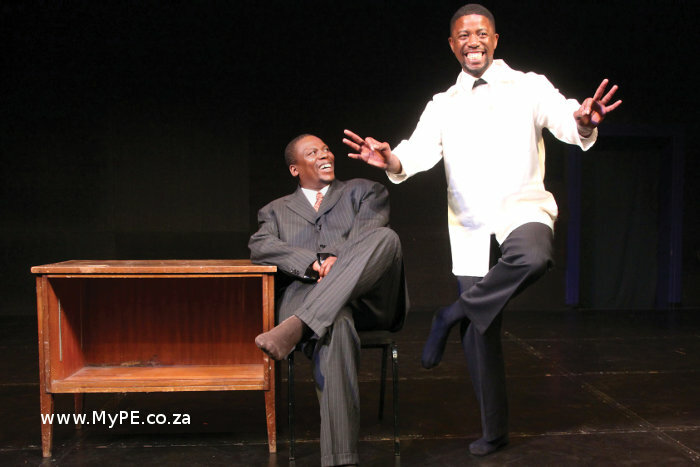 The production explores freedom and identity in a true South African manner and varies between humour and seriousness. Atandwa Kani makes the role, which his father played four decades ago, his own with his very unique style. Shabangu’s excellent character interpretation brings out the humour in this masterpiece. “Myself, Winston and Athol were like Dr. Frankenstein who created a monster, which ruled our lives for more than four decades. I was glad when we were approached by the Syracuse and Princeton Theatres in America, to revive the production. It gave me the opportunity to work with young South Africans who were not born when this drama was shown to audiences for the first time,” says John Kani. Before the production was taken to America, it was first on show at the Markteater in Johannesburg. Sizwe Banzi is Dead will only be on show thrice at the KKNK, from 14:00 on 24 until 26 March. Theart will be talking to Mannie Manim, John Kani and the actors about the production on 25 March at 15:45, after the show. Hannes van Wyk will also be talking to John Kani and Sandra Prinsloo on 24 March at 08:30. These two South African theatre icons will be speaking about their careers and the interview will also serve as a look back at the 1985 production of Miss Julie, which was produced by August Strindberg, where a kiss between these two performers was shared on stage and led to a walkout by audiences. The original theatre production premiered in 1972 at the Space Theatre in Cape Town. Thereafter it was performed with great success in London and New York. In 1974, it received the London Theatre Critics Award for Best Production. In 1974, the production was nominated for multiple Tony Awards, the ‘Oscars of theatre’ in America. Nominations included Best Production, Best Regie and Best Actor (for both John Kani and Ntshona, which they both won). The production was also nominated for the same awards at the Drama Desk Awards in New York. The production made headlines last year in America and in local theatres, including the Markteater and the Baxter Theatre. Atandwa Kani is nominated for a 2016 Fleur du Cap award as Best Actor for his character in the production. The Fleur du Cap awards will be taking place on 20 March 2016. Mannie Manim, one of the founding fathers of the Markteater, is the producer and lighting designers of this production. Since 1972 he has been involved with this production. John Kani and Winston Ntshona was arrested in 1976 by the former safety police and was kept in solitary confinement for 23 days. They were released after mass protests were held worldwide by theatre role-players.